An interview with Detroit News reporter Jim Lynch. A proposal by a Canadian power company to store nuclear waste at a site within a mile of Lake Huron is setting off alarm bells on this side of the border. Ontario Power Generation is drawing up plans to store low-to-medium level nuclear waste at an underground repository it wants to build in Ontario near the town of Kincardine. That is on the shore of Lake Huron and critics, including some state lawmakers, worry that storing nuclear waste so close to the lake could threaten the drinking water for 40 million people. Detroit News reporter Jim Lynch has been following the story and he joined us today from Detroit. 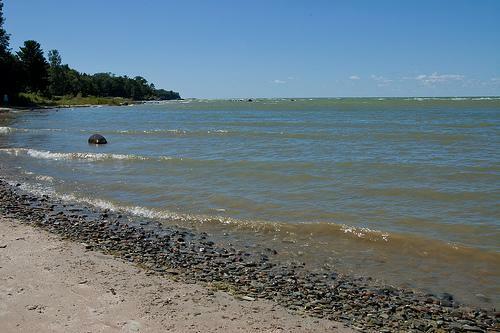 Local environmental activists are concerned over a proposal that would create a nuclear waste dump less than a mile from the shores of Lake Huron. Community members met at a town hall meeting this week at Wayne State University to discuss the proposal. DETROIT (AP) - Objections to a proposal to build a nuclear waste storage site near Lake Huron's Ontario shoreline are the subject of a town hall meeting Monday evening in Detroit. The Detroit News says the meeting is scheduled for 6:30-8 p.m. at Wayne State University's Keith Center Lecture Hall. The meeting's organizers include Democratic state Sen. Hoon-Yung Hopgood of Taylor. He sponsored a resolution that the Michigan Senate passed in May questioning the proposal.